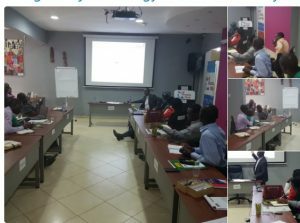 Selected Journalists from media organizations in Ghana have participated in a capacity-development workshop organized by Penplusbytes on 25 January 2018 at the New Media Hub,Osu-Accra. The training which was held under the theme – Ghana’s Natural Gas Sector: Overview, Prospects and Effective Exploitation for Economic Development, aimed to enhance the knowledge of journalists on Ghana’s nascent natural gas sector.The workshop was the latest in the Power Reporting Series organized by Penplusbytes with support from the Ghana Oil and Gas for Inclusive Growth (GOGIG) . Co-chair of the Ghana Extractive Industries Transparency Initiative (GHEITI) and Chairman of the Civil Society Platform on Oil and Gas (CSPOG) Dr. Steve Manteaw, and the Director of Commercial Operations of the Ghana National Gas Company (GNCC) Mr. George Amoako-Adjei, spoke at the event. The Director of Commercial Operations at the Ghana National Gas Company (GNCC) Mr. George Amoako-Adjei, briefed participants on the operations of the company which was established in 2011 as an entirely state-owned enterprise.He mentioned the core commercial activities of the GNCC included the processing, shipping and transportation of gas. He pointed out that the company had challenges with gas pricing, overlapping roles of regulators, gas supply, demand for gas and institutional alignment. Speaking on the topic: Effective Exploitation of Natural Gas as Catalyst for Economic Development and Employment Creation, Dr. Steve Manteaw took participants through the development of the natural gas sector in Ghana,opportunities and challenges within the sector.He indicated that Ghana currently had an estimated total of 1,960 billion scf in associated and non-associated gas reserves from the Jubile, TEN and Sankofa Gye Nyame fields, with additional reserves of 120 Bscf promised by the Mahogany and Teak Discoveries (Greater Jubilee) upon development. He stated that the gas revenue of US$9.32bn earned in 2016 represented 4% of the country’s total petroleum revenue for that year.He opined minimum efforts to operationalize the Ghana Gas Master Plan and little stakeholder engagement on the master plan slowed down development of gas infrastructure for the development of the sector. Urging serious efforts to take advantage of the opportunities in the natural gas sector, Dr. Steve Manteaw suggested active engagement of relevant stakeholders on the gas master plan, compliance to the gas master plan,clearance of the energy sector debt, proper infrastructure development and greater transparency, accountability and citizen’s participation were crucial towards achieving greater and lasting economic value in the sector.